CLOSE: Friday 17th May 2019. The cost for spectators is $25 per person, and includes morning tea and lunch. MUNA is an annual event that is part of an International Rotary project to educate senior high school students (years 10 - 12) on the United Nations organisation and its vital commitment to world peace, in addition to health, education and living standards around the world. MUNA is held in many Rotary Districts around Australia. 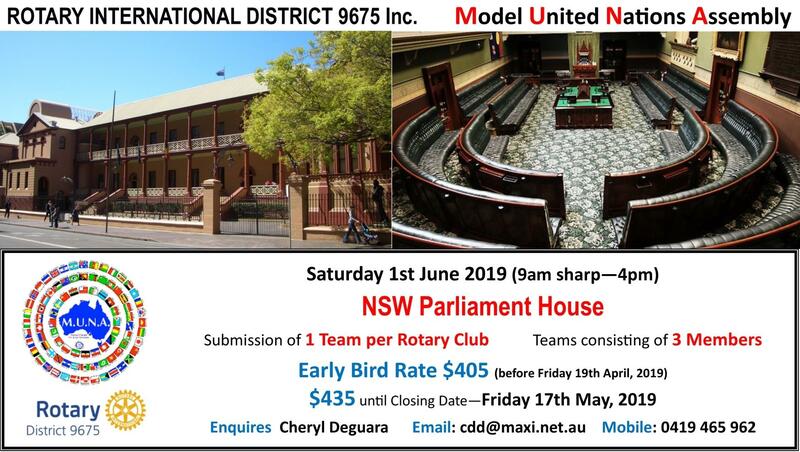 The team that places first in MUNA in our district will be invited to compete at the Australian National MUNA at the Old Parliament House in Canberra (with financial support from Rotary). Teams will be notified by email of the 2019 resolutions and which country they have been allocated before the event. Participants are encouraged to do as much research on your country as possible to improve their understanding of the country and its issues that relate to the 2019 resolutions. Use your research to form a stance on each resolution, and propose any amendments to 1-2 resolutions for open debate at MUNA. Be prepared to argue your position on each resolution and any of your amendments so you can convince the assembly to vote in your favour. Participants are also strongly encouraged to adopt their country’s national dress to add to their presentations. There will be a separate award to the team with the most appropriate / interesting national dress.